Steve Berghoff and Mark Haslip of Menlo Group Commercial Real Estate received the Certified Commercial Investment Member designation from the CCIM Institute. Tempe, AZ, April 09, 2019 --(PR.com)-- Menlo Group Vice Presidents Steve Berghoff, CCIM, and Mark Haslip, MBA, CCIM, recently earned the Certified Commercial Investment Member (CCIM) designation from the CCIM Institute. The advisors were recognized for their achievement at a ceremony held earlier this month in San Antonio. Just over a year ago, Berghoff and Haslip decided to pursue the designation as a way to distinguish themselves in their field. To earn the designation, they completed nearly 200 hours of coursework on topics such as financial and market analysis, negotiation and ethics before passing a six-hour comprehensive exam. They were also required to compile a portfolio detailing their transaction work. Berghoff has worked in commercial real estate for 16 years and been with the Menlo Group team since 2015. He primarily represents landlords of medical and professional office properties in the East Valley. Haslip had a successful sales career at Henry Schein Dental, a Fortune 500 dental supply and equipment company, before switching to commercial real estate in 2017. At Menlo Group, he helps dental and medical professionals find real estate as they start, relocate and expand their practices. 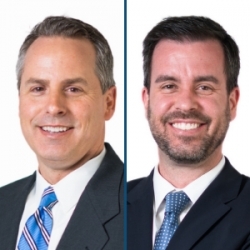 Berghoff and Haslip join an international network of 13,000 commercial real estate professionals, which includes some of their Menlo Group colleagues. Six of the company’s 10 advisors now hold the CCIM designation. Menlo Group Commercial Real Estate is a full-service commercial real estate brokerage located in Tempe, Ariz. The company aims to illuminate the path to success for its clients through its unique Menlo Process, Menlo Trusted Advisors and Menlo Way. To learn more, visit www.menlocre.com.